Firstly, you need to verify to Office 365 that you own the domain you used for your Gmail Account. 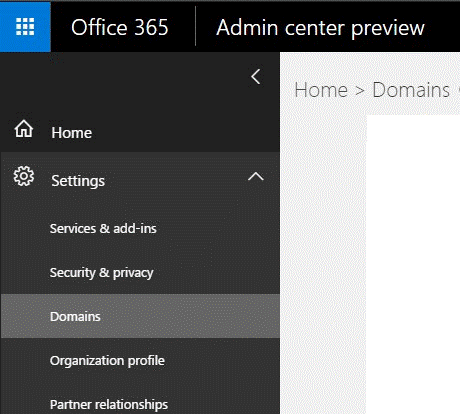 But if you use your Office 365 subscription instead of using your own custom domain, you can just add users after creating them in Office 365. Before creating users, a relevant license is required. Each user should be assigned to a mailbox to expedite the email migration process. Now, from the “Admin center,” click on “Users” on the right panel -> “Active Users” -> Click on the “More” button, -> “Import Multiple Users” option. For Single User Entry, click on “Add a user” from the above screen and enter the values manually. 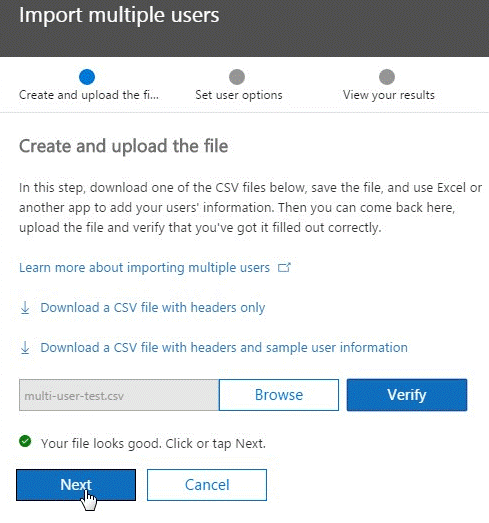 Using “Import Multiple Users,” you can download a sample excel sheet, and use it as a reference to add your users. Some of the important fields of this CSV file include Username, First Name, Last Name, Display Name, Age, Mobile Number, etc. First, compose an Excel File that contains a compiled list of Gmail mailboxes to migrate to Office 365. At the time of creating the migration file, you must know the password of each Gmail mailbox you want to migrate. Temporary passwords can be assigned to the mailboxes during migration. You must be an administrator in G Suite to reset passwords. Mailboxes can be migrated in batches as per the convenience of the user. Select List of users in the Google admin center. 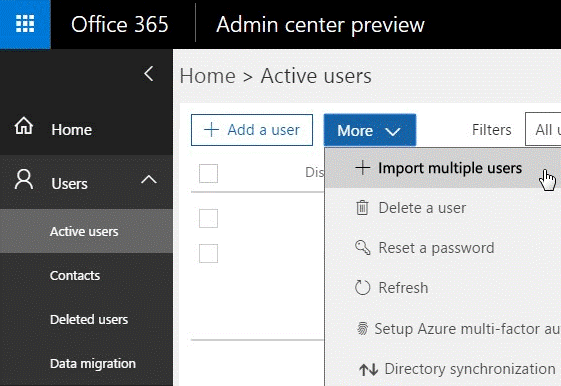 Sign in to the Office 365 admin center and go to Users > Active users. Start Excel. Enter credentials like email address, username, and password for each mailbox you want to migrate. Enter one mailbox per row. In the Exchange Admin Center, go to Recipients > Migration and click ... > Migration endpoints. On the new page, select IMAP. Click Next. The migration service uses the settings to establish the connection to Gmail system. If the connection works, the ‘Enter general information page’ opens. Type a Migration endpoint name in the Enter general information page, for example, Testcase-endpoint. Leave the other two boxes empty. Click New. 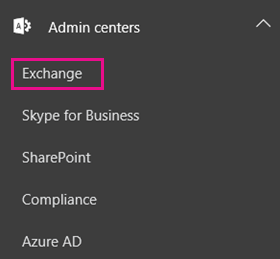 In the Office 365 admin center, go to Admin centers > Exchange. Select IMAP migration > Next. On 'Select the users' screen, click on “browse” and select the previously created CSV file for migration. Click on “Next”. After validation, Office 365 displays the Gmail mailboxes. Click Next. On 'Set the migration endpoint' screen, select the migration endpoint (the one you created in the previous step), and click Next. On the IMAP migration configuration window, continue with the default values, and click Next. On the Move configuration page, type the name (no spaces or special characters) of the migration batch in the box—for example, Test1234-migration. Also, provide the names of the folders to excluded.Click Add (+) icon to add them to the excluded list. On the Start the batch page, provide the required options and start the migration. Email systems employ a DNS record called an MX record to seek out the exact address for email delivery. During the email migration process, your MX record was pointing to your Gmail system. It’s time to point your MX record to Office 365. After you change your MX record, email sent to your Gmail Account is delivered to Office 365 mailboxes. Click on “Domains” and then Select your domain name. It would normally display “Setup in progress”. Add records for me – This option will connect to your DNS domain (For example, GoDaddy) and update the MX records automatically. I’ll manage my own DNS records – This option gives you the flexibility of inserting a list of DNS entries (MX record values) that follows the manual addition process from your domain registrar. Click on the 2nd option, and now you need to add MX Records on your DNS. For every domain, the MX record value will be different. It skips already migrated files and avoids redundancy in data migration from source to destination. It ensures complete accuracy and security of entire dataset throughout the migration process. Migrates Gmail data to both hosted and on-premises Exchange deployments. Comes with smart filters of IMAP to Office 365 migration tool that permits you to migrate selected mailbox data using multiple attributes like date range and item-type filters (emails, contacts, etc.). As the manual procedure for Gmail to Office 365 migration is error-prone and time-consuming, it has been suggested to try third-party tools in migrating Google data to Office 365.